How small can you make a set of HiFi speakers? A few months ago I realized that I was going to be traveling a lot over the next few years, and I started to explore how tiny I could design a speaker system without losing fidelity, so I didn't need headphones to watch videos on my laptop. My goal was to produce a set of small speakers, with a tiny matching amp, that could travel in a suitcase with me, my laptop, and my FLAC/MP4 collection. 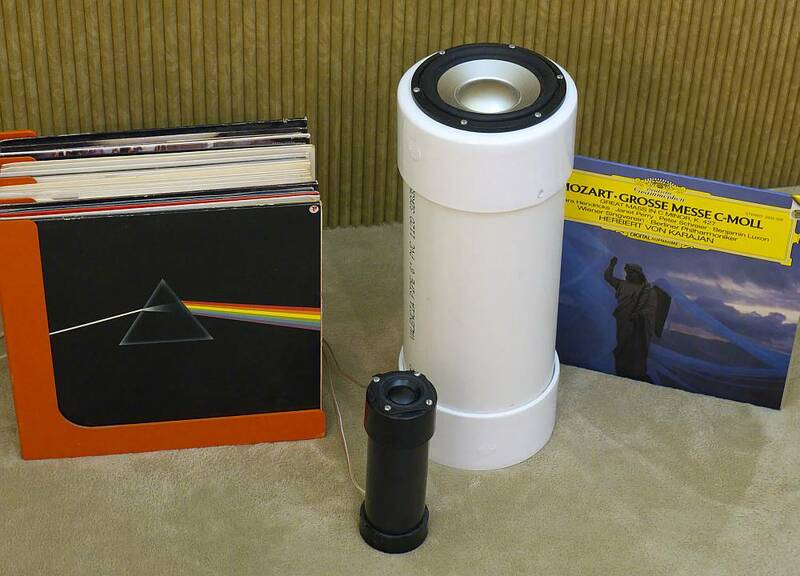 What I developed is the 8" high black speaker you can see in the photo. It uses the magnificent Peerless Tymphany 83093 widerange driver, covering 50Hz-20KHz (with MiniDSP <ka precomp). It stands on the floor, and uses 'ground-effect' to help radiate its low frequencies. However, in all but the smallest rooms, the 2" widerange needed a little more power in the bass region, so I added a woofer, using the SEAS driver from my Linkwitz Pluto (the white tube) to boost output power between 20Hz and 200Hz. Last edited by trevmar; 01-16-12 at 08:02 AM. Last edited by trevmar; 01-16-12 at 07:25 AM. That's super cool! Thanks for sharing. Hello can you use the minidsp HD. Thank you for sharing a truly wonderful project .